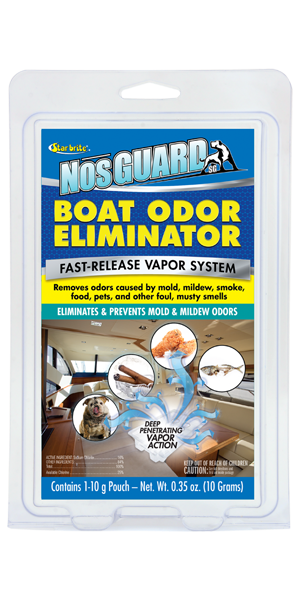 NosGUARD SG Boat Odor Eliminator - begins working immediately to eliminate foul odors caused by mold, mildew, pets, food, smoke and garbage. Each patented CLO2 Chlorine Dioxide generator pouch treats an area up to 1,000 cubic feet (10' x 10' x 10). Ideal for cars, RVs and boat cabins. It is the fastest and most effective solution for dealing with situations such as a leak during winter storage that results in damp, musty odors. Professional strength NosGUARD SG Boat Odor Eliminator is not a cover-up or a perfume fragrance of any kind. Chlorine dioxide gas safely destroys all odors and leaves behind a crisp, clean scent (similar to a swimming pool) that will quickly dissipate with fresh air. NosGUARD SG Boat Odor Eliminator is not to be used while people or pets are present. Air out the area after treatment. After the area has been treated, use NosGUARD SG Mildew Odor Control Bags - Slow Release Formula to keep enclosed spaces odor-free.